16 Mar 2016 | Bez kategorii · What's new? Is the name of a beautiful and necessary initiative promoted by Association of Families and Friends of People with Mental Disorders, CONCORD. 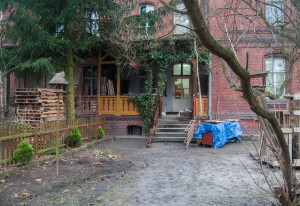 It is a Environmental Self-Help space for people with Mental Disorders in Gniezno. A big old house with an extensive garden full of possibilities, where they are currently working in rebuilding it and filling It up with good energy. Is not only the beautification work on reconstruction… In this lovely place, is where they are carrying out activities developed for integration and improving the quality of life of people who have or have had some type of mental disorder. Developing positive relationships with relatives, neighbors, public places, offices, cultural institutions. Assistance in dealing with administrative matters. Information on entitled health services. However, this is not the end of their initiative. They are also working on the project called “Czilii” – a social cooperative project in which its activities include catering service for the hospital, “Dziekanka” and Crafts (including handicrafts from recycled materials)- This cooperative project, is currently being developed with the support of legal aid experts from the Association For Social Cooperatives. In order to read more about their handicrafts and the options for colaborate with them, I invite you jump to their webside www.domanki.pl.